What a privilege it was to get to set up a large book display at the 7th annual Youth Workers and Student Leaders event held at Messiah College, near us here in Central PA. (By the way, you can earn a Masters in Youth and Young Adult Ministry at Messiah, from some folks I greatly respect.) Youth workers, volunteers, teens and college students browsed our books, asked good questions, and complimented us on the diversity of titles we stock. We’ve been told that we have one of the best selections of youth ministry books—theoretical stuff and “how to” books, visionary resources and curriculum pieces, books on service projects and books on retreat planning, books and DVDs of Bible study and goofy resources for games, getting kids talking, and various sorts of experiential activities. â€¨â€¨We carry much of the classic backlist of major youth min monsters, Youth Specialties and Group. We have Anabaptist resources from Mennonite and Brethren publishers and Roman Catholic titles (like the good stuff from St. Mary’s Publishers.) We have almost all the youth-related books done by Pilgrim Press and Westminster John Knox as well the ones from Presbyterian & Reformed. Abingdon does a lot and we stock ’em. We love Barefoot Press, an edgy and thoughtful publishing venture of the Nazarene Publishing House, who are doing some of the very best youth books out these days. Anyway, we try to represent a lot of different sorts of resources and trust that our display at Messiah illustrated the good work of many different presses, many different gifts from many corners within the Body of Christ. It was great to listen to Mark Yaconelli, the keynote speaker this year, whose three books are very, very important and really useful. But before I name them, let me set the stage. A good number of years ago, I made a prediction, and I’ve patted myself on the back a couple of times (hee-hee) when it came to pass. 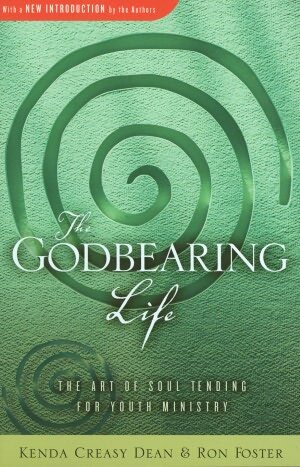 When The Godbearing Life: The Art of Soul Tending for Youth Ministry by Kenda Creasy Dean & Ron Foster was published by the Upper Room in 2005, I said it was a watershed moment in the history of youth ministry publishing. It was seminal, offering a new model, and a new emphasis, drawing on the new millennium revival of contemplative spirituality that had been sweeping the churches. From Henri Nouwen to Richard Foster, Joyce Rupp to Dallas Willard, Richard Rohr and Ruth Haley Barton, harkening back to desert fathers and mystics like Brother Lawrence and A. W. Tozer, folks were yearning for deeper encounters with God. It was only a matter of time until somebody seriously said that we should let the kids get in on it, too. Godbearing suggested that programs and curriculums and techniques and games and activities need to be toned down; kids in their fast-paced world—a social context that has only gotten faster, and much more virtual—need, mostly, for the church to provide a place to calm down. To be quiet, unplugged, to know God in the gentle ways shown to us by the monastic traditions. Godbearing Life wasn’t interested in boring kids, but it also wasn’t interested is stoking their energies, winning them over by sheer fun and enthusiasm; okay, maybe it wanted to bore them a little; the authors are from Princeton, after all. (Sorry, that was a joke.) It was wonderfully counter-cultural, seriously theological, and, mostly, contemplative. It was to usher in a new approach to youth ministry, inviting spiritual practices, quiet discipleship, and a radical perspective that seemed unlike the big, slick programs of the big slick churches (or the little frumpy churches trying to ape the big slick churches.) It was nearly evangelical, embodying really good news that there are ancient ways that help us know the triune God. We can help kids slow down, grow in grace and mindfulness; we can learn the art of attentiveness. We can see our ministry not about numbers or pizazz, but bearing witness to God’s work, already active, in the world, and in the lives of our teens. Well, that brings us to the Messiah Youth Ministry Conference, always a great, solid event. This year, as I noted, the remarkableâ€¨ Mark Yaconelli was their keynote speaker. Mark had us all howling in laughter, just like his crazy dadio, the late, great Mike Yaconelli—would have, with wild stories of outrageous pranks and Kingdom trouble-making. Mark is a great example of this next generation of spiritual leaders within youth ministry leaders and authors. Yac 2.0 can be as zany as his dad, but speaks in ways that sound less specifically evangelical and more ecumenical. His imaginative prayer experience could have been done at a Taize service or taken from an Upper Room prayer book. His vision of listening deeply to the kids who hurt—and, according to Chap Clark’s essential books like Hurt, that is an inordinate percentage of youth, including many, many church kids—was quite profound. It wasn’t that he didn’t want to share the gospel with kids (he clearly, clearly does!) but the way into that is at first, and largely, incarnational, being in authentic, healing relationships, shown mostly by beholding. Listening. But who knew contemplative, Nouwen-esque spiritual work could be so darn fun? It was a good day. And, for the record, thanks to at Messiah who sat through my rambling workshops, presented on sheer adrenaline and the good grace of God’s sustaining energy. I had gotten virtually no sleep the night before, so my show and tell book time was half revival service and half infomercial. I hope it was helpful. the secure webpage order form. Thanks. Almost Christian: What the Faith of Our Teenagers is Telling the American Church Kenda Creasy Dean (Oxford University Press) $24.95 I suppose almost everyone who pays attention to youth ministry and church-related publishing will know this is a heavy, academic, research-based indictment about the feeble views of religion that are articulated by most American churched teens. We have championed it, and referred to it here. From conservative to mainline, Catholic to Jewish, Dean shows (drawing on Christian Smith’s research) that congregations are failing at giving their kids a theological framework and vocabulary to know what in God’s name we’re supposed to believe. Bleak. Essential. To say this is a wake up call is putting it mildly. I was glad some ordinary lay volunteers seemed to have heard of it (good for them) and not surprised that a lot of folks had not. If you’re not buying it from us at our discounted price, get it from your church library, who ought to have it available. Or your public library if your church doesn’t have a resource room for sharing books. It is worth it. The Theological Turn in Youth Ministry Andrew Root & Kenda Creasy Dean (IVP) $18.00 This is the Andrew Root who teaches at Luther Seminary and who wrote the important Revisiting Relational Youth Ministry (IVP; $17.00) and the wonderful Promise of Despair: The Way of the Cross as the Way of the Church (Abingdon; $18.00. ) And, yes, this is the KCD who rocked us all with Godbearing Life. And, yep who wrote the must-read Almost Christian. This new one is spectacular, offering truly theological takes on various aspects of youth ministry culture. It is not silly and it is not light. It is amazingly astute, and of interest for anyone who (a) likes theology or (b) doesn’t like theology because it is so often abstracted away from life. There are chapters like “The Eschatological Significance of Church Camp” and one on “Hormonal Theology” and an amazing one on hermeneutics. I like the way the theology of the cross comes up time and again (Root is a Lutheran, you know) and it is good to have ruminations on important stuff like mission trips, confirmation mentors, and outdoor wilderness trips. (There isn’t much really good stuff on outdoor education from a profound theological frame so some—you know who you are!—should buy this just for this chapter.) I named this a book of the year after it was released late in 2011. There is nothing like it in print. Contemplative Youth Ministry: Practicing the Presence of Jesus Mark Yaconelli (YS/Zondervan) $19.99 I love the preface of this by Anne Lamott. Her son Sam, introduced to the world in the beautiful Operating Instructions, ends up being a kid with the good fortune of having Mark Y as a youth worker at his church in a formative year or so. A conversation with Sam ends up in the book, so Anne glowed and commended the book, and the integrity of Mr. Y. You can read more about Sam, by the way, in the brand new memoir he helped out with by his famous mom, Some Assembly Required which I’ll review here later. It is poignant and funny, Anne’s first bone fide memoir, about becoming a grandmother. More to the point for this post, though, you can read Mark’s description of his contemplative model for doing the God-bearing life thing. This is a truly wonderful book, very highly recommended. Downtime: Teaching Kids to Pray (Zondervan) $19.99 The first few chapters offer fabulously written overviews of the contemplative life, why youth need adults to help them into this sacred space, and how to live into the model of ministry he so wonderfully described in his previous book. The second half is loaded with exercises, experiences, lessons, and tools for teaching historic practices that create transforming encounters with the Holy. In some ways, this is like the great little paperback (another book that illustrated this movement of spirituality books for teens) Soul Shaping by Tony Jones (Zondervan; $19.99.) I hardly can think of a more practical handbook to doing what so many of us talk about: actually doing the spiritual disciplines in a way that allows us to deepen our knowledge of God and be transformed into Christlikeness by God’s very present Spirit. Thanks to Jones, and certainly to Yaconelli, for guiding us in ways to not only embrace these spiritual disciplines (I don’t really like to call them tools, and even less to refer to them as techniques) with teenagers. Wonder, Fear,& Longing: A Book of Prayers Mark Yaconelli (Zondervan) $9.99 I have a very good friend who routinely uses this with middle school kids, and it certainly is accessible to high school youth. This is a paperback collection of short devotions, great stories, ruminations and parables on the divine presence, Biblical studies that point us to God in a way that names and honors and attends to our own longings, the need for wonder, our fears and hurts. All of us — including youth– have these mystical longings, these desires to appreciate God’s creation, an appreciation for quietude. This is really, real stuff, raw, sometimes, but good, and, I believe, beautiful. It is a prayer book, a book of prayers, Biblically-based and imaginative, grounded and poetic, wonder-full, and yet very usable. Love it. OMG: A Youth Ministry Handbook edited by Kenda Creasy Dean (Abingdon) $26.00 This may be a bit pricey for a paperback, but it has become the definitive resource for creatively ruminating on the meaning of youth ministry in mainline denominational churches. Others should learn from it, but the style and ethos of this multi-authored work is rooted in a realistic sort of faith perspective… I have a few friends who I really trust who work in or teach youth ministry and they all agree this is one of the best books they’ve seen on this topic. If you don’t do youth ministry yourself (and your still reading this) ask the youth pastor at your church if she or he knows this. They should. faith that really sticks (get it?) There are three books in this series, first, a basic book (for anyone, really, but perhaps aimed at parents and the everyday ways we can help pass on a sticky faith. There is a youth worker’s edition, obviously for those in congregational leadership, volunteers youth workers or Sunday school teachers or others who want the church to be more influential in the lives of their youth. And then there is this one, the one that is the curriculum piece, designed to use with older youth. Fabulous stuff, coming out of the significant studies being done out at Fuller Theological Seminary. All three are tremendous. Thanks to those at Messiah who purchased one or more of the set. If you love using one of these, let us know if you want one of the others. All three are unique and truly valuable. A World Unbroken: Hope and Healing for a Shattered World (Barefoot Ministries) $14.99 I love the create way this book explains the coherent unfolding drama of basic plot of the Bible; each chapter colorfully describes episodes of creation, brokenness, promise, presence, satisfaction, mission and hoped for restoration. Authors include Scot McKnight, Ian Cron, Kara Powell, Chris Folmsbee, Mark Oestreicher and other creative women and men. What a great book, with a very contemporary design and hip feel. 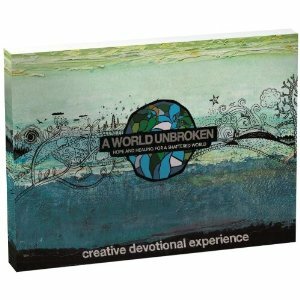 A World Unbroken Creative Devotional Experience (Barefoot Ministries) $10.99 This very creative, edgy youth journal goes along with the Bible overview, helping kids process this vision of a world being restored to goodness and beauty. There are spaces to doodle, pages for art, lots of good opportunities to dream big dreams, imagining how the big Biblical story of restoration could help inspire us to be agents of God’s mission. DVD A World Unbroken: Creative Media Experience (Barefoot Ministries) $59.99 Here is how they describe this supplemental resource for the World Unbroken project: This comprehensive DVD has seven animated short films that visually depict the story of God through the Bible. Also included on this DVD is a seven week curriculum that uses the videos as a discussion starter to journey deeper into the story of God. By the way, besides the 7 short films, the group discussion questions there are tons of extras—t-shirt designs, behind the scenes footage, other cool stuff on the disc. DVD What Did I Sign Up For? Things Every Youth Ministry Volunteer Should Know Chris Folmsbee (YS/Zondervan) $31.99 If I were in charge of a youth ministry program, I’d buy this thing and pass it around so that everyone who helps out watches it. (Or, have a party and view the stuff together–even better!) This training course includes four major sections of the classic stuff folks really do need to know, presented in a fairly no-nonsense sort of way. It is nicely done, nothing outrageous, just tons of good info and some nice enouragement. Here are the main units: Understanding Youth Work and Youth Ministry, Relationships and Partnerships, Developing Programs and Environments, and Administration and Logistics. The Adolescent Journey: An Interdisciplinary Approach to Practical Youth Ministry Amy Jacober (IVP) $18.00 Okay, I’m going to admit–this may be designed to be used as a text book at some Christian college that teaches youth ministry, or maybe for a youth min class at seminary, if seminary teaches such things. But I think we volunteers most need this stuff — we who aren’t specialists and need a good, one-volume course on adolescent psychology, faith development, and applied theology for their lives. This is meaty, I know. It’s why you should get it. Kudos to IVP for giving such solid resources for those of us who want to learn as much as we can, to do our jobs well. And for that great cover art. I hope you sold a lot of books, Byron!